We don’t want you to miss out on our latest hot deals and updates to all our exciting destinations. Please sign up below to ensure you receive them directly to your inbox. Yes, I would like to receive your latest hot deals and updates to all your exciting destinations. Please add me to your email list. Thank you for organising such an exceptional trip to Canada & Alaska. We were more than happy with all aspects of the trip and in particular the accommodation which was far better than we expected. We were most impressed with your organisation of our trip to Alaska. From our first contact with Adventure Destinations, your service has been prompt, efficient and friendly. We will seriously consider using Adventure Destinations in the future. You can also be sure that we will be recommending your company to our friends and relatives. I was impressed with the business class service on Air Canada. The cruise was excellent and the staff and the service offered on board was FIRST class. The Rocky Mountaineer was the stand out with a level of professionalism and service being the best I have encountered in our many years of overseas travel. Many thanks for your organization and you can be rest assured that we will deal with you again without hesitation. We had a wonderful trip! Everything went very well-no hiccups of any kind. The organization was spot on. The meals and accommodation were great. The guides left nothing to be desired and treated us magnificently. THANK YOU for your part, (particularly the excellent and courteous service), in what was a most memorable and enjoyable trip. Thank you for the excellent itinerary you constructed for our recent holiday in the USA and Canada. We would like you to know that when the inevitable crises or hitches occurred we were confident that if needed we could rely on your skill and professional expertise to help us out. These are the sort of factors which generate customer loyalty to Adventure Destinations and you certainly have that from us. We are back in Adelaide, rather jet-lagged but very satisfied with a great six weeks of travel. All the arrangements you put in place worked perfectly and the various parts of the trip were all we hoped they would be. We are very happy with the service we received from Adventure Destinations. I just wanted to send you a short email to let you know what a wonderful time we had in Canada and Alaska and for the work you did in putting together a wonderful itinerary for us. We took your advice and went on a helicopter flight and went Dog Sledding, it was awesome. Hello Lucy, we got back from our fabulous holiday on friday morning around 10 am and what can I say – we enjoyed EVERY minute of it. On the cruise we met other Adventure Destinations customers ( didn’t know there was so many) who were all doing their own thing (just like us ) and I am so pleased that we chose you to do our itinerinary for us. I am just so satisfied with the way you did everything for us that I have written Adventure Destinations phone no. in my address book with 3 stars next to it so that I will not lose it. The planning & organisation was perfect with incredibly efficient time usage maximising our holiday thrills. Mike is the perfect travel guru. His talents and skills are utterly remarkable and we feel amazingly lucky to have had the benefit of his personality and knowledge as well as all the other areas of his expertise. Our accommodation was always wonderful and the variety of it and the different environments was brilliant. Obviously our contact with the animals (the key reason for our trip) was absolutely beyond our expectations and we are still euphoric. The staff in all aspects of Botswana Explorer were friendly, helpful and a joy to be with but the guides’ knowledge of so many different aspects of catering to the needs, safety and general thirst for knowledge of their tourists was absolutely amazing. I’d like to make particular reference to our Mobile Safari Family. These men were beyond compare (and I include Mike with them). Words cannot cover the care they showed and the knowledge they imparted. We were very sad to say goodbye. I’m sure you’ve had other messages of a similar vein because all the people on our trip shared the joys, excitement and gratitude for the privilege we experienced whilst on Botswana Explorer so I won’t go on for fear of boring you but please accept our sincere thanks for all you did and pass our thanks on to everyone concerned. I would like to thank your Company for the excellent experiences enjoyed on the Vietnam and Cambodia group tour. The Guides supplied were excellent with each one giving a clear description and explanation of History & Cultures of Cambodia & Vietnam. All Tours went on time & were well organised with travel undertaken in modern Air Conditioned Coaches, Venues selected for Lunches & Dinners were prepared for our arrival on each occasion and each did their best to satisfy our Group with the selection of meals. Selection of Hotels were of a high standard with our selection being the Hoi An Hotel in Hoi An & the Vien Dong Hotel in Saigon. I would not hesitate to recommend Adventure Destinations to any of my friends and circumstances permitting look forward to using you again. The arrangements in Vietnam and Cambodia were faultless and we were taken care of very well. The hotels were all great and the trip was beyond our expectations. Be assured we are already thinking of returning and have handed your name and details to other people who also wish to go. We cannot thank you enough for such a memorable holiday. It is embedded firmly in our memories and hearts. We had a fantastic time on our recent trip which far exceeded our expectations thanks to your excellent organization. We were even fortunate enough to see an orang utan in the wild when we traveling along the Kinabatangan River. The guides were great and the accommodation was comfortable. We urge you to read this information carefully prior to making your reservation. The information presented in our brochure is correct to the best of our knowledge at the time of printing but is subject to change without notice. Changes may occur since publication with respect to prices, itineraries, duration of holidays, service standards, tour content, airline fares and schedules. Please confirm details of your requirements at the time of booking to ascertain if there have been any alterations to the tour you select before you book. Prices stated in this brochure are in Australian Dollars ($AUD) and are indicative only and current at the time of printing. Adventure Destinations reserves the right to vary the cost of the tour, taxes and airline prices if necessary by reason of currency fluctuation, component cost increase, or airfare increase. All prices are subject to confirmation from local tour operators. A non-refundable 25% deposit per person, with a minimum of $250 per person plus a signed and completed Adventure Destinations booking form, is required within 7 days (unless otherwise stated) of confirmation to confirm a booking. We recommend booking early to avoid disappointment. Receipt of non-refundable deposit and the signed/completed booking form, will be taken as an understanding by Adventure Destinations that the participant has checked their confirmed travel arrangements and has read and agreed to the terms and conditions set forth in this brochure. Some overseas suppliers require either an additional or higher non-refundable deposit to be collected to meet their booking conditions. These are usually between 20% and 50%. Please contact Adventure Destinations for full details and to see if this applies. Otherwise relevant details will be provided upon confirmation. Payment in full must be completed no less than 60 days before travel. Note: some tours may require payment earlier and this will be advised with the booking confirmation. No surcharge in respect to cost or currency fluctuations will be made to the arrangements of your holiday once full payment has been received by Adventure Destinations, unless any changes are made to your booking in accordance with these terms and conditions. This price guarantee does not apply to: fares, charges or levies imposed by airlines up until ticketing; or any taxes, charges or levies imposed by government or their agencies. As all Adventure Destinations touring modules and packages are based on confidential and specially negotiated rates, we reserve the right and will not give out nor supply a breakdown of costs at anytime. The above are Adventure Destinations cancellation fees. Airlines and Tour Operators may have additional fees. Transfer of a confirmed booking to another tour or departure date is deemed to be cancellation of the original booking. No refund for cancellation or unused services on or after commencement date. Please note that employees of any overseas suppliers are not authorised by Adventure Destinations to make any undertakings to our clients in respect of refunds or other matters. International and domestic airfares and airport/hotel transfers are not included unless specifically stated. Passports, visas, vaccinations, passenger taxes, insurance, meals (other than those stipulated), emergency evacuation costs, all items of a personal nature such as excess baggage, telephone calls, laundry, room service, airport taxes and government taxes. For security reasons, airlines and our overseas suppliers, require names to be given exactly as stated in your passport. It is your responsibility to provide this important information. If you or your Travel Agent do not advise the correct information and we have to re-issue airline tickets or other documentation, then you will incur any fees charged, such as airline cancellation charges or re-issue fees, in addition to Adventure Destinations own administration fee. Adventure Destinations endeavours to perform all holidays in line with published itineraries but reserves the right to amend or alter itineraries for such reasons as service requirements, seasonal demand, road or weather conditions or unforeseen circumstances. Where a change is of a significant nature, it will be advised to all tour participants. Adventure Destinations reserves the right to substitute hotels, lodges, inns and camps with properties of similar standard. 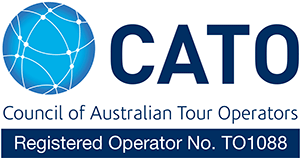 Any reservations made within 60 days of travel before departure from Australia must be accompanied with either full payment or a credit card guarantee, due to being within the cancellation penalty period. In addition a late booking fee of $55 per file will be charged for bookings made within 14 days of departure. Should you need to alter your original reservations, due to extra administrative and communication costs incurred, there will be an automatic fee charged of $50 per amendment or transaction. Additionally there may be cancellation fees levied by the tour operator or fees may be applicable where arrangements have been pre-purchased. It is a condition of your booking that you are adequately insured for the duration of your trip. We recommend a comprehensive travel insurance to cover cancellation, health requirements, luggage and additional expenses. Insurance policies rarely cover for loss of cash. The choice of insurer is at the sole discretion of the client. We strongly suggest that insurance be purchased at the time the non-refundable deposit is paid, as Adventure Destinations cancellation conditions will be strictly enforced. Whilst every effort is taken to ensure the accuracy of hotel and tour information, we rely on the information supplied to us. As all hotels and tour operators can make changes to the service and facilities, with or without notice, Adventure Destinations cannot be liable for any errors or omissions caused by the hoteliers and operators concerned. You must have a valid passport with a minimum of 6 months validity from departure date from the country you are visiting. The Australian Department of Foreign Affairs and Trade issues travel advices on most countries. These are available by calling 1300 555 135 or visiting their web site www.smartraveller.gov.au. We recommend that you review this information both prior to making your booking and prior to departure. Please discuss with your doctor, Travelvax or a Travel Medical Vaccination Centre, in regards to any recommended or compulsory vaccinations and medical requirements. It is your responsibility to ensure that you have the appropriate vaccinations and necessary documentation required. It is mandatory that you familiarise yourself with any visa requirements applicable in the countries you are visiting. Foreign nationals require a re-entry visa for Australia, which should be obtained before departure. Adventure Destinations will not be held responsible for passengers travelling without the correct travel documents. We refer you to the following link for VISA guidelines www.adventuredestinations.com.au/Visalink.html. This information is a guide only, so please check with the appropriate consulate for exact information. Adventure Destinations does not itself provide carriage services, accommodation, transport or tours. Adventure Destinations acts as an agent for accommodation providers, air, coach, shipping, rail and other transport providers, tour operators and other service and product providers (referred to as “Service Providers”). All products and services provided by Service Providers are provided on those Service Providers own terms and conditions which may include limitations and exclusions of liability. All bookings with Adventure Destinations and all tickets, vouchers, receipts, coupons, exchange orders and other like documents issued to the client, are subject to each Service Providers terms and conditions governing the provision of products and services to be provided by that Service provider. Adventure Destinations shall not be liable for any acts, omissions or defaults whether negligent or otherwise, of any Service Providers. Adventure Destinations shall not be liable (whether in contract, tort or otherwise) for any injury, illness, death, loss, damage, expense, delay or inconvenience resulting directly or indirectly from circumstances outside of Adventure Destination’s control, including acts of nature, war, civil disturbances, strikes, floods, acts of government or authorities, breakdowns, accidents, disease, quarantine, terrorism, medical or customs regulations, and alterations, cancellations or delays concerning itineraries, timetables or accommodation. Should you encounter any problems on your holiday, it is always better to try and solve it directly with the supplier. If it is not possible to do so and you wish to lodge a complaint please do so in writing within 30 days of completing your Adventure Destinations arrangements. The contract between Adventure Destinations and the client shall be governed by the laws of the State of Victoria. By making a booking with Adventure Destinations, the client agrees to be bound by the terms and conditions referred to in our brochure and in the Adventure Destinations booking form.